The 2016 Acura MDX builds upon its reputation of comfort, value, and performance while incorporating a host of upgrades, making it a top contender in the three-row luxury crossover segment. Providing prime performance and top-notch safety, the Acura MDX is everything you could want from this class, and it’s now available at Paragon Acura. Every version of the 2016 Acura MDX runs on a 3.5L V6 engine that makes a robust 290 hp and 267 lb-ft of torque while attaining an EPA-estimated 27 mpg highway. When properly equipped, the latest MDX can tow up to 5000 pounds. Also highly impressive is its sprint to 60 mpg in 6.5 seconds flat. The 2016 Acura MDX is packed with standard and optional premium safety technology, such as a multi-angle rearview camera, blind spot monitoring, automatic braking with frontal collision warning and mitigation, a lane departure warning system, and more. A unique road departure mitigation program is also available, which helps to keep you from drifting off the road into any objects. Better yet, the MDX earned a top five-star rating in government crash tests, and received high marks from the Insurance Institute for Highway Safety as well. The 2016 Acura MDX comes with some of the most advanced technology on the market. Entertainment-wise, you have access to a 10-speaker Acura/ELS surround-sound audio system, complete with HD radio, a rear-seat DVD system with a 9-inch or 16.2-inch screen, and a 110-volt power outlet to charge all of your electronics. You can also expect the availability of 19-inch alloy wheels, rain-sensing wipers, GPS-linked and solar-sensing climate control, parking sensors, and heated seats throughout the cabin. Are you ready for the luxurious functionality of the 2016 Acura MDX? If so, head to Paragon Acura, conveniently located at 56-02 Northern Blvd. in Woodside, NY. 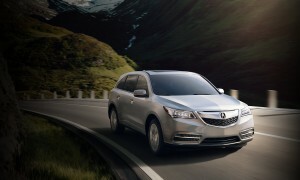 We have plenty of MDX models in stock and can quickly get you behind the wheel for a test drive. Feel free to call our sales team at (888) 416-3614 with any questions!